Lifesaver-Cutter Tool » Protective Solutions, Inc. The ResQMe Lifesaver-Cutter tool easily cuts Cobra Cuffs for release, cuts seat belts and contains a compact window breaker as well. Great personal rescue tool for automotive accidents or emergencies. 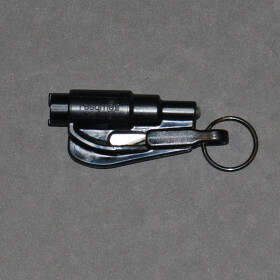 Great for first responders and small enough to fit on a key chain. Window breaker works on any tempered glass window and is easy to use.